Entredeux means “between two” in French. It is a narrow strip of batiste with tiny square holes down the center of the strip. I love to use it between two seams and when joining lace to fabric. Gives the dainty vintage effect I love! I have purchased entredeux ready-made when necessary. I would much rather use my BERNINA aurora 450 − in minutes I’m sewing a long strip of entredeux. I use a 110/18 Wing needle, and the stitch I prefer is the entredeux stitch pattern (check in your sewing machine manual to see if your model includes this stitch). If your machine does not have it, try using the venetian, daisy, zigzag, or triple zigzag. The pattern must flow from side to side. If you stitch the batiste strip on the bias the holes will open easier. Use a cotton organdy, batiste, or a similar lightweight fabric, 60-weight cotton thread, cording, and the Wing needle. 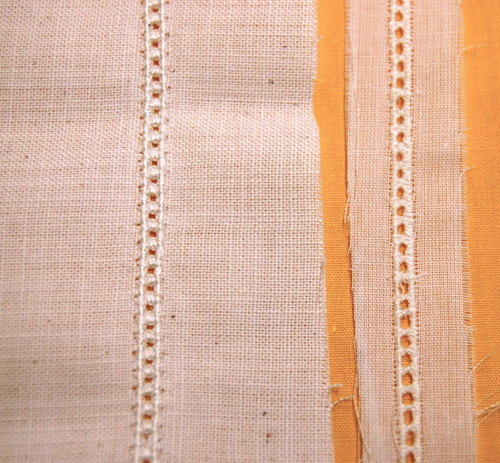 The cording raises the outer edges of the stitching. 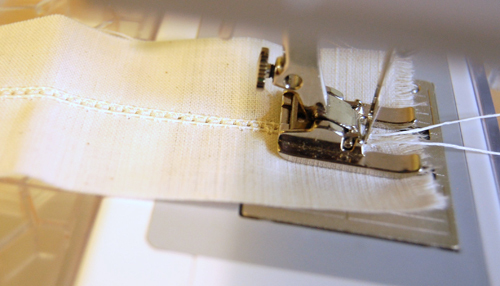 If your stitches begin to pucker, place appropriate-weight stabilizer under the fabric strip. 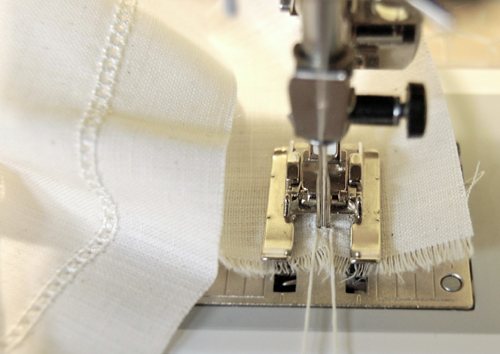 Be sure to engage the twin needle function of your machine so the needle does not hit the foot. Adjust the stitch width according to your stitch pattern. Play around on scrap fabric to get the right adjustment. I start with a 2.5mm stitch width and 3mm stitch length and adjust accordingly. The best foot to use is the 7 Groove Pintuck Foot #32 as the cording fits nicely in the grooves just to the right and the left of center. If that foot is not available try the Open Embroidery Foot #20, sewing slowly while guiding the cording into place with your hands. What stitch number is the entredeux stitch? I’d love to tr ythis, but would prefer to use the proper stitch. What stitch # and foot should I use for the 830 to make the entredeau stitch? What size cording is used? Is it like cordenett or something a bit larger?